These Holidays are designed to include some of Spain's most beautiful and lesser known landscapes. This is the 'Real Spain' at its best. 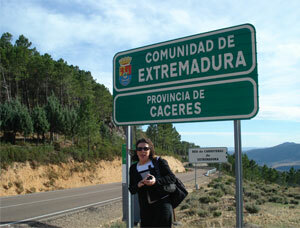 LORNA ROBERTS, together with MAP Travel, is the official representative in Ireland for the SPANISH PARADORES. 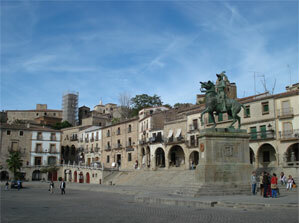 Paradores are charming, comfortable hotels in the most scenic, interesting and historic areas of Spain. Good news for anyone driving to Spain from Ireland. Brittany Ferries have a new route started in 2018, twice weekly from Cork to Santander in Northern Spain. 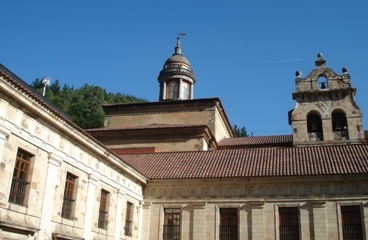 This is a good starting point for the lovely Paradores in the area: the restored monastery at CANGAS DE ONIS, the new Parador in the heart of the countryside at CORIAS and the coastal Parador at GIJON - all in Asturias, and in Cantabria the two Paradores in the medieval village of SANTILLANA DEL MAR, the mountain Parador at FUENTE DE at the top of the Picos de Europa, and the restored palace at LIMPIAS, between Santander and Bilbao. My favourite route when driving to the South of Spain is to go West from the ferry ports to cross the mountains on the road from Oviedo to Leon and then stay at some of the 7 beautiful historic Paradores in Extremadura, and on the "Silver Route", the wild and wonderful region between Salamanca and Seville. This is an excellent road with autovias (non paying motorways) most of the way and being lower than most of inland Spain it is generally warmer than the Plain to the East. Plasencia, Caceres, Jarandilla de la Vera, Trujillo, Guadalupe, Merida and Zafra - see photos below. Lorna Roberts has been the official representative in Ireland for the Spanish Parador hotels. 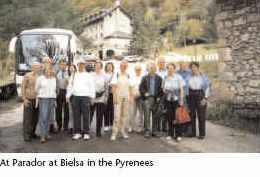 She has travelled all over Spain and has taken more than 50 groups around the Paradores in some of the most remote, scenic and interesting parts of Spain. She works from her home in Connemara, with MAP Travel, who are now the official representatives for Paradores in their office at 26 Upper O'Connell St in Dublin. Lorna knows all the Paradores and has, over the past 5 years, introduced Patricia Kenny of MAP Travel to more than 60 Paradores, including the new one in the castle at Monterrei which they visited recently. Lorna makes reservations and plans routes for clients for fly-drive holidays, city breaks or one-centre Parador holidays beside the sea and she, and MAP Travel, will always find the best possible rates by checking all the various promotions offered by Paradores. She also has some exciting escorted tours planned for next year. For further details please contact Lorna Roberts direct..
MAP Travel, 36 Upper O'Connell Street, Dublin 1. On our four tours in 2017 we travelled from North to South, from East to West, from the Atlantic to the Mediterranean and from the Picos de Europa to the Sierra de Ronda visiting so many corners of "Real Spain" and had perfect weather all the way, even in February when we had temperatures of 24 degrees when we spent a week in the lovely Parador at Javea. 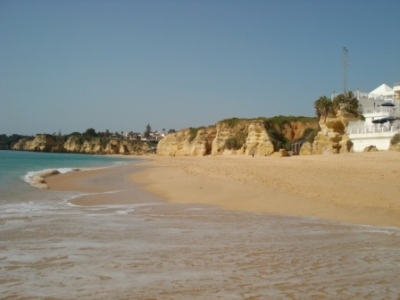 In 2018 we had 3 very different tours staying in the Portuguese Algarve and the Parador in Mazagon in February, in Galicia in NW Spain , staying in Paradores at Santiago de Compostela and Baiona in early October, and in Andalucia later in October, staying at Paradores at Cordoba and Nerja and at Hotel Alhambra Palace in Granada. Photographs of our holidays are in the escorted holidays section of this website. 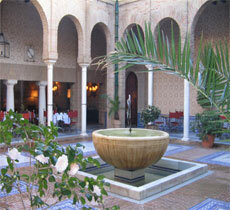 There are photos of more than 50 different Paradores where we have stayed with groups. 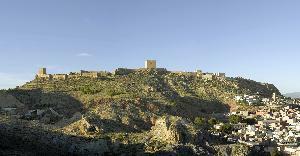 If you are planning a holiday these photos will help to give an idea of the variety of Paradores and their locations. Calle Larios, Malaga ANDALUCIA - February 2019. 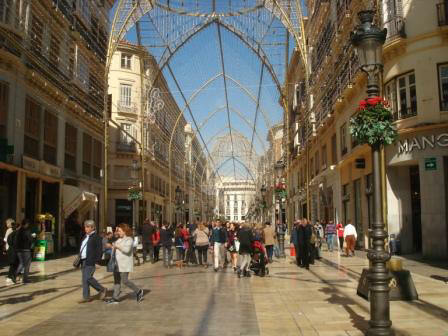 We had a good week with perfect weather staying in 2 very different Paradores at CADIZ and MALAGA GIBRALFARO. 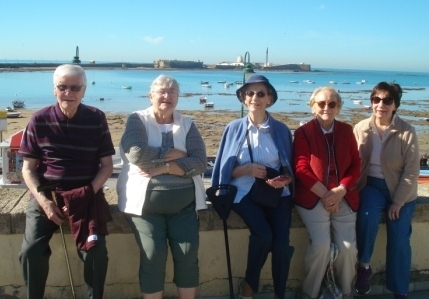 We also visited Sanlucar de la Barrameda at the mouth of the Guadalquivir River, Conil de la Frontera, and Tarifa, three places in the wonderful province of Cadiz. We ended the holiday with a snack at the Parador at Malaga Golf before going to the airport, just 10 minutes from the Parador. Some sensible people stayed on at Malaga Golf for a few extra days! CANTABRIA & LA RIOJA staying at Paradores at LIMPIAS and STO DOMINGO DE LA CALZADA including the famous visit and lunch at the bodegas of “Marques de Caceres” and a drive (or walk) along the Camino de Santiago to the World Hertitage city of Burgos. Many people ask Lorna how she came to be based in Connemara - all is revealed in the Lorna in Ireland section of this website. Lorna has travelled extensively all over Europe, has written books about her travels and plans routes and itineraries for her clients as well as taking small escorted groups around the Paradores. There are 94 Paradores in Spain (including 5 in the Canary Islands, 4 in The Pyrenees, 2 with their own Golf Courses at Malaga Golf and El Saler, and 2 in North Africa). Many are located in castles, palaces and monasteries, some in Medieval villages, others in historic cities and coastal ones, generally in modern buildings in the unspoilt areas of the Mediterranean and Atlantic coasts. Lorna can tell you virtually everything there is to know about the Paradores and is happy to arrange routes and itineraries and make reservations for you at the best possible rates, availing of the various promotions offered at different times of year. 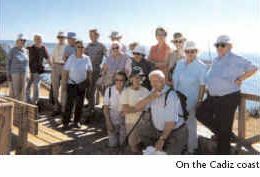 In the Spring and Autumn Lorna escorts small groups on holidays staying in Paradores in the hidden corners of "Real Spain". 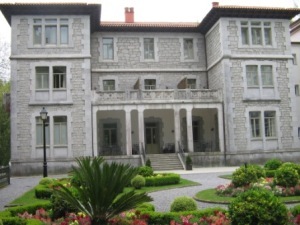 92 of the 94 Paradores and can help with route planning and advising which Paradores are most suitable, as there is such a variety of hotels and different ones appeal to different people. Lorna is also able to work out a route to take advantage of special promotions. Lorna's book "Discover Real Spain & the Paradores" describes her own personal journeys across Spain and can be helpful when planning routes. See below. DRIVING IN SPAIN is such a pleasure on uncrowded motorways through spectacular scenery. 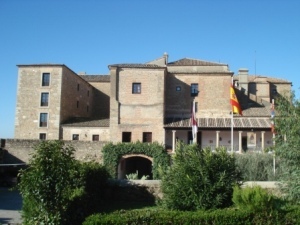 Many of the finest historic Paradores are very close to the motorways so if you are planning a fly-drive holiday or taking your own car to Spain here are a few suggestions of wonderful places to stay en-route, and we can find the best rates by checking all the offers and promotions. views of the Gredos mountains. bedrooms decorated to suit the palace. motorway from the French border to Galicia. ports, so a good base to start or end a holiday. Many other carefully restored castles, palaces, convents and monasteries are also close to Autovias - or Autopistas (AP roads with tolls) including HONDARRIBIA overlooking the Bidasoa estuary which separates France and Spain, GRANADA, JAEN & CARMONA in Andalucia, SIGUENZA near the motorway between Zaragoza and Madrid, SANTILLANA & CANGAS DE ONIS close to the Autovia del Cantabrico, CUENCA & ALARCON on the routes from Madrid to the East coast, TORTOSA & LORCA on the east coast route, ALMAGRO, a few kilometres west of the Autovia from Madrid to the south, SANTIAGO DE COMPOSTELA & PONTEVEDRA in Galicia, and some of the loveliest Paradores in the centres of the monumental cities of Extremadura - PLASENCIA, CACERES, TRUJILLO, MERIDA & ZAFRA. MAP Travel in Dublin are now official representatives for Paradores in their office at 36 Upper O'Connell Street. They give the same rates and discounts, can book flights and also offer excellent rates for car hire, so they can organise your whole holiday. 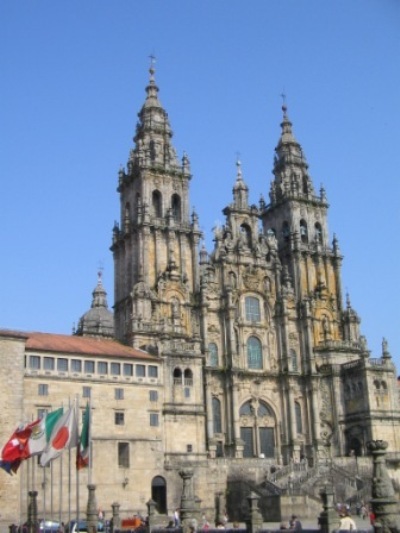 They are also specialising in WEDDINGS IN PARADORES and arranging tours along the CAMINO DE SANTIAGO. 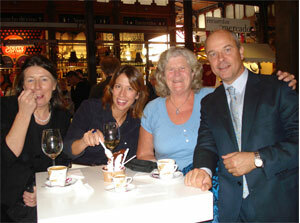 MAP Travel have worked with Lorna organising her escorted tours since 2002. Marian and Patricia (hence MAP) have now visited over 55 Paradores and travelled with Lorna in many areas of Spain so are now the joint official representatives in Ireland for the Paradores and can advise you on routes and work out the best rates for you. ESCORTED TOURS: For details of this year's holidays click on Escorted Holidays section. For prices, travel arrangements and day to day itineraries see www.maptravel.ie and look at Paradores and Escorted Tours. We do not include flights as many people prefer to fly separately from different airports or on different dates, but we do advise booking flights as early as possible to avoid price increases. JAVEA is an hour’s drive from Alicante. A very well run Parador is beside the Arenal beach in a small town nestling between two headlands in the loveliest part of the Costa Blanca. All rooms have balconies and sea views, and the well kept gardens lead to the sea. A perfect base for a short or long winter break. 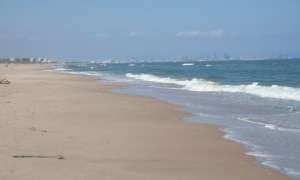 EL SALER was recently rebuilt on its original site between the Albufera Reserve and a long, sandy beach, just 15 km from the city of Valencia. 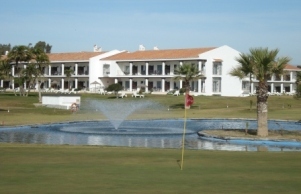 It is Photo surrounded by a 27-hole championship golf course El Saler so an ideal base for golfers or non golfers. 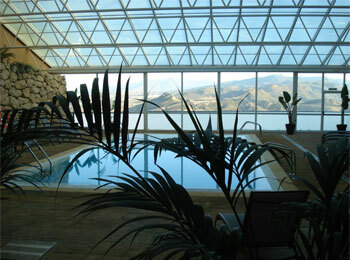 The Parador has a spa and indoor pool. 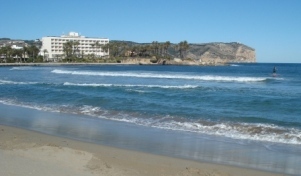 NERJA, although an expensive Parador in high season, the winter rates are much lower. 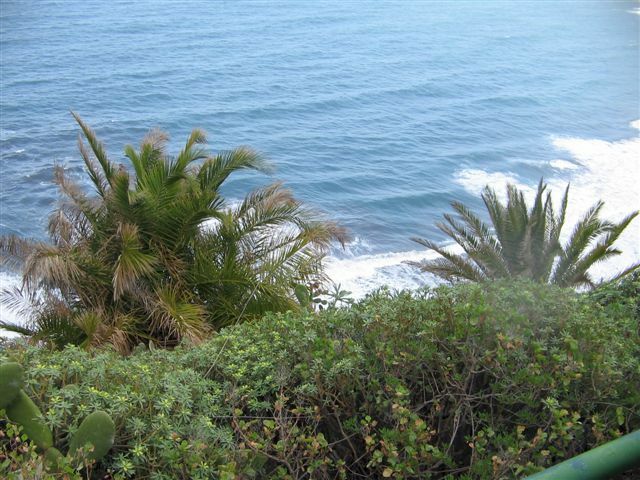 Situated on a cliff above the Burriana beach it has its own lift from the garden to the beach. Most rooms have balconies and sea views. Nerja is 50 Km from Malaga, so could be combined with a few nights at MALAGA GIBRALFARO beside the castle walls on a hill above the city. MALAGA GOLF is only a 5-minute taxi journey from the airport, so very accessible for a short break, but equally good for a longer holiday. 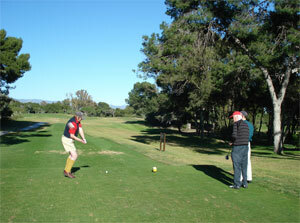 Surrounded by its 27-hole golf course, which leads to the beach, it is in a tranquil corner of the Costa del Sol. All rooms have balconies or terraces. A local train runs from the shopping centre nearby to the airport and city centre. AIGUABLAVA, although one of the most expensive Paradores in Summer, it has exceptionally good rates in low season. Perched on a headland in the quietest corner of the Costa Brava, this is a paradise for those who want to get away from it all. 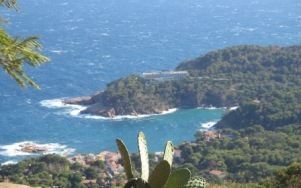 A car is necessary as there is no public transport to the village of Begur, 5 kms away. All rooms have balconies and sea views. 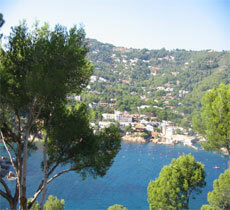 Why not combine 5 nights at Aiguablava with a 2 night city break in Barcelona? 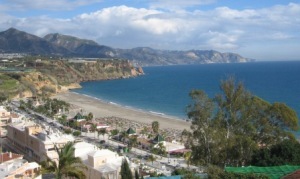 MOJACAR is beside the beach in the province of Almeria in the south east corner of Spain, which claims to have the best weather. 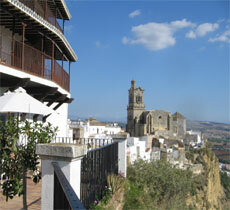 The Parador is at sea level below the “Pueblo Blanco” (white village) of Mojacar with a regular bus service to the village. A very relaxing place for a winter holiday. 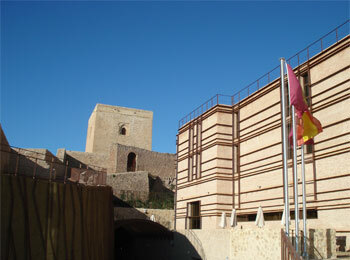 The new Parador at Lorca opened in July 2012. The stunning modern building has been built within the castle walls on a hill above the town, which is 30 Km inland from the Murcia coast. During the excavations the remains of Muslim and Jewish settllements were discovered, including a 15th century Jewish synagogue. 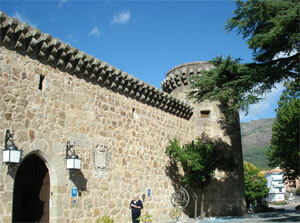 These have been preserved and showcased around the Parador. There is also a magnificent spa and indoor pool. 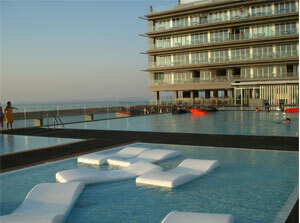 PARADOR IN CADIZ - OPENED ON 1st SEPTEMBER 2012. I was invited to spend a few days in the new Parador in Cadiz before it was officially opened on 1st September. The old Parador closed in October 2009 and although a very different building the new one is a most impressive construction on the same magnificent site beside the sea and yet only a short walk from the Cathedral and historic city centre. All rooms have balconies and sea views, most of the same staff are working there and many furnishings, paintings etc from the old Parador are featured keeping a connection with the past. 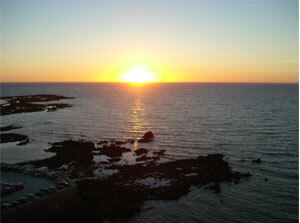 The whole Parador is spacious and light - this is "La Costa de la Luz". The pool area and spa are one of the main attractions overlooking the Atlantic Ocean and sunsets for which this coast is so famous. I visited the new Parador at Corias, a beautifully restored Monastery in the heart of the mountains of Asturias. 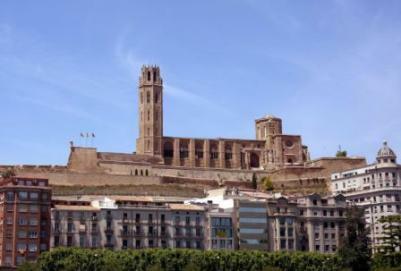 A new Parador opened in 2017 at Lleida, 170 km inland from Barcelona, mid-way between Barcelona and Zaragosa. 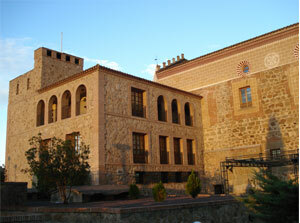 The Parador is located in the seventeenth century Convent of Roser. I have written features on the different regions of Spain, including the Mediterranean regions of Andalucia, Catalonia and Valenciana & Murcia, and also on Galicia, Asturias & Cantabria, the Basque country, La Rioja & Navarra, Castilla, the Canary Islands and the Balearic Islands. If you would like to receive any of these please send your email address and I will send them by return. People often ask me which is my favourite Parador. As there are 94 and all very different, this is an impossible question to answer, but I do have a Top 5 and there are certain ones that I am particularly attached to, so I featured different Paradores with a page on the website dedicated to each one. These holidays are designed to include some of Spain's most beautiful and lesser known landscapes. This is "Real Spain" at its best. There will be no pressure, no early morning starts, and no compulsory sightseeing. Most Paradores are less than one hundred miles apart, but on the occasional day when a longer journey is necessary we will follow the advice of the AA which is to have a break every 2 hours or every hundred miles, so there will be no exhausting long journeys. We aim to make the travelling a pleasure and organise lunch breaks in interesting places. 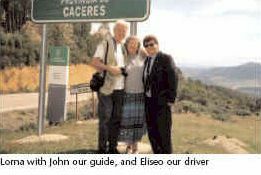 The coach will be there to transport you from Parador to Parador, and will be on hand for optional excursions to places of interest. For the energetic there are spectacular walking routes, for the culturally inclined there will be visits to archeological sites and museums, and for nature lovers we include Nature Reserves and National Parks. 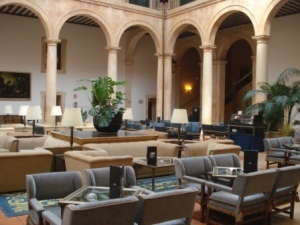 These are value-for-money holidays which include accommodation, breakfast and dinner (most nights) including wine, coffee etc, in Spain's Parador hotels, or hotels of similar quality where there is no Parador. 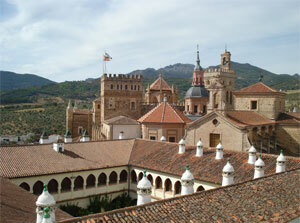 By following a route via Paradores the most remote and scenic regions of Spain are discovered. A non refundable deposit of 250.00 Euro per person, together with a completed booking form, should be sent to MAP Travel. When completing the booking form please advise if you have your own travel insurance. Otherwise it will be automatically added to your invoice. Should we have to cancel a tour the deposit will be refunded. There are no 'hidden' extras as all travel in the bus, drinks with dinner, porterage, restaurant tips and excursions are included. Entrance fees to Museums etc. visited on optional excursions, bar and personal bills in hotels and snacks during the day will be charged for at the time. On occasional nights we have not included dinner, to enable people to have a choice of restaurant. Journeys between hotels have been planned to see as much as possible en-route. These are dependent on weather conditions and will be changed if necessary. These are Parador holidays with golf, combining the relaxation and interest of our tours with golf competitions at some of Spain's finest courses. Green fees and buggies, or trolleys, are included in the price. For non golfers there are optional excursions every day. A Golf Holiday at Paradores is a whole new experience combining the unique Parador hotels at Malaga Golf and El Saler with their own Championship Golf Courses. Step straight from your bedroom onto the Golf Course. 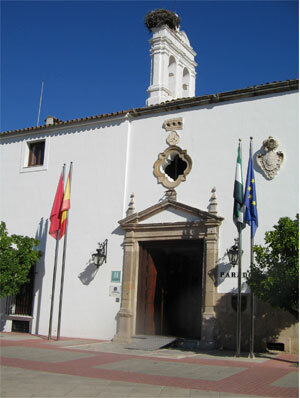 A group of golfing enthusiasts have returned from sunny days with temperatures reaching 24 degrees when they played at the 2 Paradores surrounded by 27-hole courses where Parador guests are given a 50% discount, reducing green fees at El Saler ( near Valencia) to 48 Euro, and to only 37 Euro at Malaga Golf. El Saler hosted the Spanish Open in April 2013 - this wonderful course looked awesome on television. 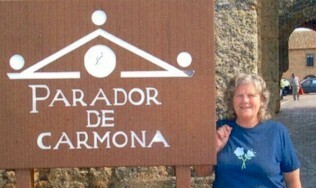 Lorna and Patricia Kenny of MAP Travel visited Paradores in Extremadura in October. This is the Western area of Spain alongside the Portuguese border. It is a combination of historic cities, National Parks and nature reserves, renowned for its gastronomy producing excellent wines and cheeses, and most famously the Jamon Iberico, the best ham in Spain, from the black pigs which feed on the acorns on the plains of Extremadura. 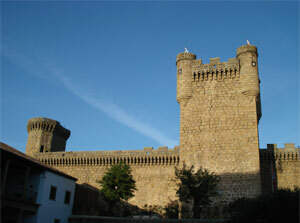 Some of the Paradores in Extremadura were included in our escorted holidays in October 2013. This is now 60 pages in full colour with new routes to help you plan your travels in Spain. 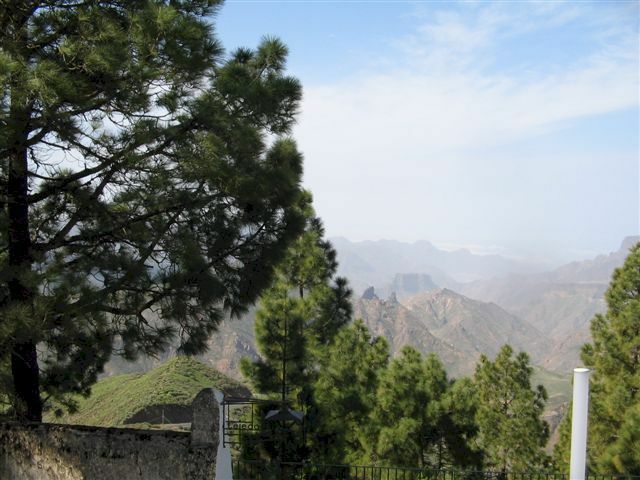 On my recent visit to the CANARY ISLANDS I visited 5 Paradores on 5 islands, including Cruz de Tejeda, the new one in the centre of Gran Canaria. This has been beautifully designed so that bedrooms and public rooms have views across the mountains. Like most of the recently opened Paradores it has a spa, gym and heated pool. 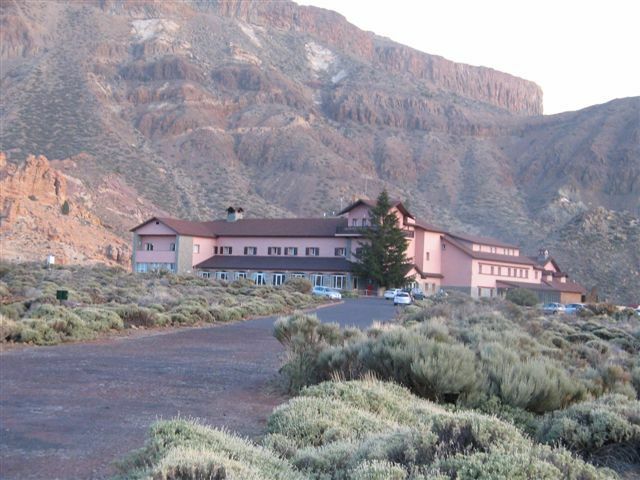 In complete contrast we stayed at a simple Parador on the smallest and most westerly island of El Hierro. 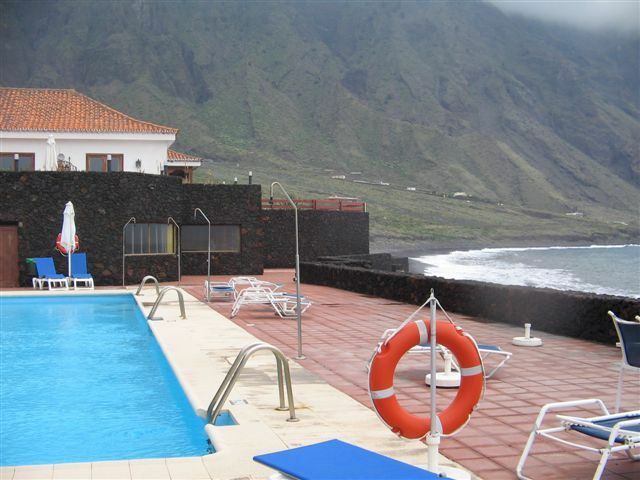 Almost sitting on a beach of black volcanic sand this is a hotel for peace and quiet, as the only activities in the area are trekking and diving, and the closest shops are fifteen kilometres away in the island's capital Valverde. For anyone wanting to "get away from it all" this would be paradise, but not to be recommended to those looking for a lively resort! We continued to the island of La Palma (not to be confused with Las Palmas the capital of Gran Canaria, and seventh largest Spanish city). 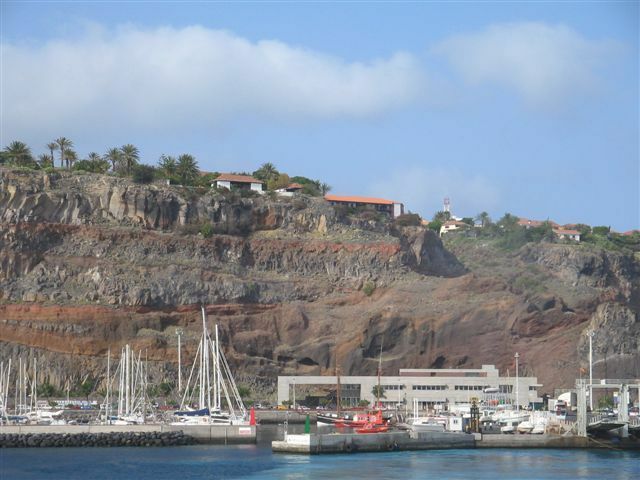 The Parador is high above Santa Cruz, the island's capital, mid-way between the port and the airport so easy to reach by air or sea. The landscaped gardens, swimming pool and sea views make this a most relaxing place to stay and the restaurant is to be highly recommended. The island is intensely cultivated with every corner being covered with terraces growing bananas, pineapples, avocados and tomatoes and the varied scenery offers plenty of scope for those who like to rent a car and explore, the highlight being the international observatories surrounded by volcanic rocks at the Roque de los Muchachos at 2462 metres (over 8000'). 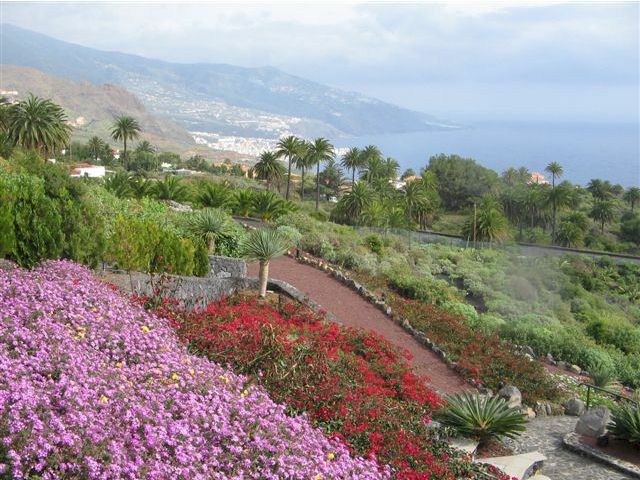 The island of La Gomera is the most accessible of the lesser known islands as it is only a forty minute ferry journey from Los Cristianos on Tenerife. 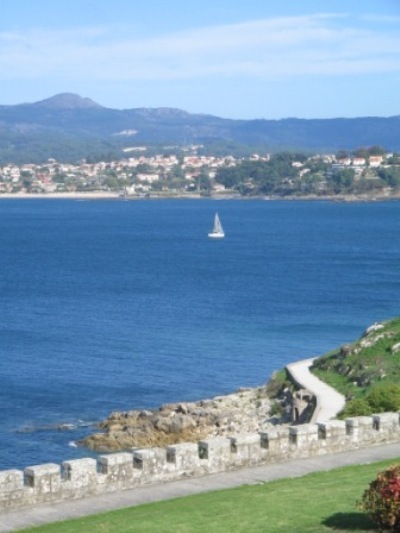 The Parador can be seen standing on a cliff above the port in San Sebastian, the island's capital. It is, perhaps the one that would have the most general appeal, as it would be a perfect base for a relaxing holiday, but for the more active the spectacular coastal scenery, small fishing villages, lush vegetation, and the many walking routes in the central National Park are all within easy reach of San Sebastian. Car hire is inexpensive and roads are uncrowded, and there is an efficient local bus service reaching all corners of the island. 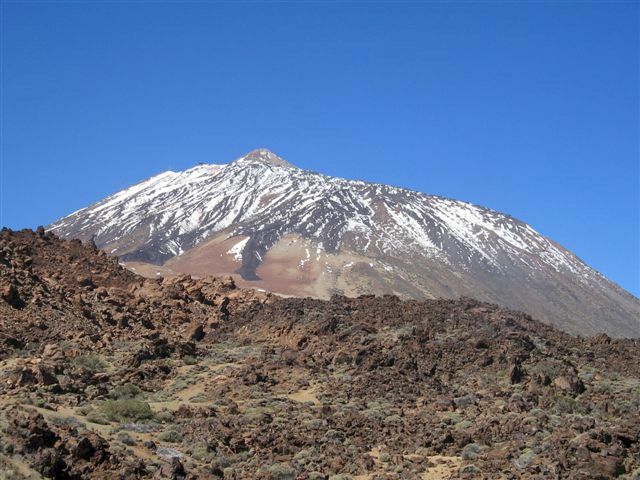 Last, but by no means least, on the island of Tenerife is the unpretentious 2* Parador at Canadas del Teide, surrounded by volcanic rocks at the foot of Mt Teide, which at 3713 metres (over 12000') is Spaighest mountain. The Parador is the only building in the Park so consequently is unspoilt by pollution and we were fortunate to be staying there on a Friday night when a local astronomer comes to explain the wonders of the night sky. We had stayed at five very different Paradores on five islands. We found that the people were especially friendly, the food good and accompanied by excellent local wines, the roads uncrowded and the landscapes amazingly varied. This was such a different world from the resorts of the Canaries seen in travel brochures. A more detailed version of this journey through the five islands can be found in the revised edition of "Discover Real Spain & The Paradores" - a personal collection of routes in Spain. Details in "Lorna's books" section on this website. Copyright © 2006 Lorna Roberts.....All rights reserved.